Hey guys, the first mental health issue I want to discuss is binge eating. When you hear about eating disorders, must people automatically think about anorexia and do not consider binge eating. People who binge eat are people who eat a lot of food in a short period of time, even when they are not hungry. This can be brought on by stress and if someone is upset and can trigger it. 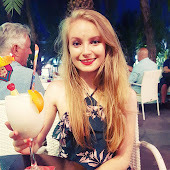 I think one thing people don't often realise is that binge eating can also come from restriction of food, some people do not have a diagnosis of binge eating but if people start telling themselves they cannot eat this or that, the likely hood is they will start binging on it at a later date or when it is in front of them. It can start from a desire to be thin but starvation can lead to people actually eating more. Nevertheless serious binge eaters will eat compulsively, some will even be dazed or forget what they ate. Immediately after eating, they feel embarrassed or guilty with their behaviour. This disorder effects woman slightly more than men but not by much and it can develop in teenage years. It is estimated it effects 1 in about 40 people. A lot of us binge eat from time to time, some of us feel bad but all of us move on and our lives, but for people who binge eat it's not that simple, there can be a vicious cycle, a need to eat constantly and this is when people need to seek out help. 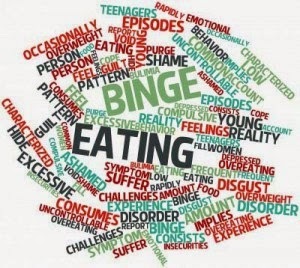 As I suggested earlier, binge eating can be caused by traumatic events, low self esteem, depression, anxiety and restricting your diet or not eating enough. Binge eating can lead to obesity but not always. 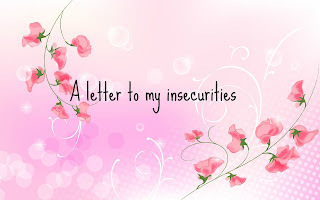 I always hate it when people who have an eating disorder are told "well you don't look like you have one." People do not have to look very thin or very large to have an eating disorder, just as people who are naturally very thin or large don't have to have an eating disorder. Binge eating can lead to anxiety, diabetes and heart problems later in life. But Binge eating can be helped, self-help, interventions, counselling and drugs. So of course there is always help available! additionally if you would like to help me this month but talk about another mental illness, please also email me, you can do so for the whole of this month! Together we will bring about change and awareness!